Why is the gmail video hosted on youtube? Google owns both. And youtube is google’s most popular video service. Hehe definitely a point that never spills into marketing/advertising. keep up the shorter delays between ELER strips! I don’t get this… where’s the punchline? @Antonimus: apart from the first and last frame, it’s punchlines all the way. I don’t believe it! New ELER comic!? Haha, I like the glass orb at the NSA. ROFL..
Oh… what the heck: keep it coming guys! @Philip: I still don’t get it. Can someone explain this to me, please? LOL. This is one of the best. Keep em coming. 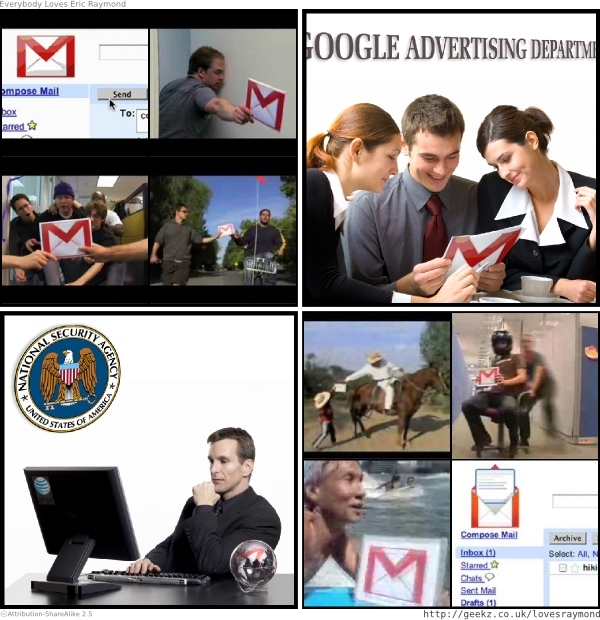 Antonimus: the idea is that of the four above panels, the first and last include actual frames from the video, and the second and third are frames that should be in the video, but aren’t, because Google would prefer not to talk about a) the way they scan everyone’s mail in order to more precisely advertise to them, and b) how your mail is vulnerable to US government surveillance. Haha. Looks like the NSA guy picked up his monitor while he was hanging out at AT&T listening to the phone calls. It might help to post a usable URL. The link should start with picasaweb.google.com but Google gave me this one when I clicked the “Share Photo” button. News about Raymond and Microsoft Open-Source Licences ! > > connect his VA laptop to the VA network for a VA board meeting. > to save his life. available for a month depsite emails about it being a 404), you will discover that . is in ESR’s PATH. i am your biggest fan ever. i love you raymond. from omadai mahadeo. i am living in guyana that is my country. my e-mail address is varsha_mahadeo@yahoo.com. please e-mail me sometimes that will be nice of you. i am 12 year old.i live at 46 indusyry crown dam. Great work! I can’t wait for the next one! Damn, I wouldn’t mind those marketing chicks, uh, reading my e-mail. I am a pretty pink unicron. “Damn, I wouldn’t mind those marketing chicks, uh, reading my e-mail.” Damn right, bro. I can has double post? Has Eric’s iPod caught on fire yet? Does a strip that has nothing to do with Eric, Richard, or Linus count as jumping the shark? Now, as far as “has nothing to do with Eric, Richard, or Linus” here you have strips that do feature the characters when they actually don’t have anything to do with the topic, except for some fictional relation. These are just two, there are a lot more examples. i love ever body loves raymond,and the acter are good,but i would lik ti say is my baby boys name is raymond and my oldler son name is robert and my daughter n law name is debbie, keep up the good fun for all, good luck to all, and we will miss ray’s show dad. Is meowhous demonstrating how to placate a troll? Meanwhile, gmail now does IMAP. why people waste time in trolling? it’s more funny to watch tv, than to see stupid comments like mine about trolls :p.
when is the next strip coming out? please i want it, i need it XD. Troll Trolling trolled trolled trolls trollingly. Troll Trolling is trolled by trolled trolls Troll Trolling trolled trollingly. Why are we waiting? because John is masturbating… when he should be creating… oh why are we waiting? I guess Hans Reiser got his hands on John after all…. Come on John, Dave’s above link to ESR’s latest tirade is perfect material for a new ELER strip!!! We need to have at lest one new ELER every two months or we’re going to have to start mocking your laziness toward mocking ESR!